We are creating with Polka Dots this week at Sweet Stamps . Well, water coloring seems to be pretty hot right now, so I cracked open the new Technique Junkies Newsletter, and tried the Tie Die Circles technique. I used Shades Die ink Spots Dandelion, Peapod and Paprika for my 'Dots'. I stamped the Crown Butterfly in Black Tuxedo ink. 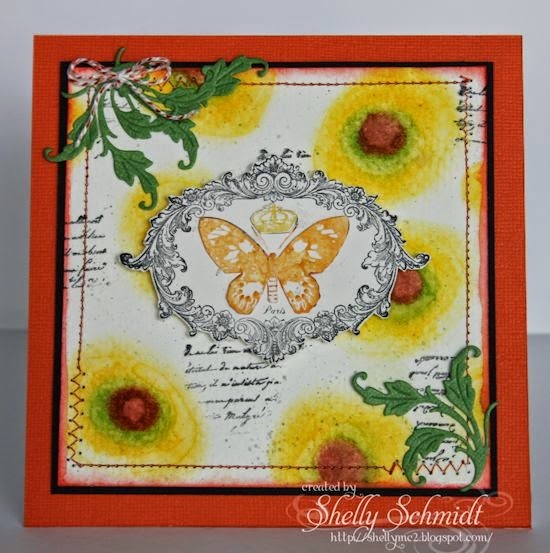 Next, I used Distress Markers Wild Honey, Tea Die, Squeezed Lemonade, Spiced Marmalade and Dried Marigold to color and stamp the butterfly and the crown. I added some AF French Writing on the BG and some machine stitching too. Come join us! We'd love to see what you make with Polka Dots. Every entry qualifies you for a chance to win $20 of items from the store at Sweet Stamps, and if you use a Sweet Stamps image- you will receive an additional chance to win! The winner is chosen by Random.org- so everyone has a chance to win! Here is a direct link to the as well- 4/15-5/14- Embossing- Wet or Dry. You have a chance to WIN- winners drawn by Random.org. What a lovely fresh coloured card - were you inspired by spring? Love it, Shelly. I've been "trying" to watercolor…nothing spectacular like this on my end though!! Love…LOVE these colors together to create your big bold dots, Shelly! Perfect with the butterfly. Super card Shelly, love that stamp. Your background is fab! Love the layout and colors used for the card. the center piece frame and butterfly are beautiful. You always do something with the coolest techniques! Love those dots and the card is gorgeous. This is such gorgeous card! Love all the detail and your colors are lovely. love the stitching and the background you created! Wonderful design, love the colors and the tie died circles. This is beautiful! I love the colors and the design! This is gorgeous! The inking is so beautifully done and I love that butterfly and frame stamp! The script adds the perfect touch to your card. Thank you for sharing this lovely creation with us at My Craft Spot!